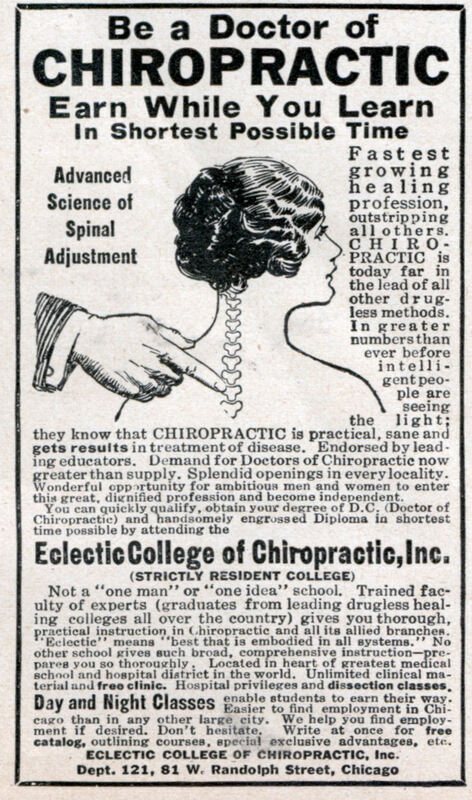 Nothing says “Professional” like a degree from the Eclectic School of Chiropractic! Fastest growing healing profession, outstripping all others. CHIROPRACTIC is today far in the lead of all other drug-less methods. In greater numbers than ever before intelligent people are seeing the light; they know that CHIROPRACTIC is practical, sane and gets results in treatment of disease. Endorsed by leading educators. Demand for Doctors of Chiropractic now greater than supply. Splendid openings in every locality. practical instruction in chiropractic and all its allied branches. ‘”Eclectic” means “best that is embodied in all systems.” No other school gives such broad, comprehensive instructionâ€”prepares you so thoroughly. Located in heart of greatest medical school and hospital district in the world. Unlimited clinical material and free clinic. Hospital privileges and dissection classes enable students to earn their way. ECLECTIC COLLEGE OF CHIROPRACTIC, Inc.
Didn’t Nick Riviera graduate from ol’ ECC? I don’t think so….the concept of “drugless healing colleges” and Dr. Nick just don’t go together. For a second there, I thought you were referring to Electic, Alabama. Is that true that I can learn chiropractor in just a short time? I think I want to try that. 61 W Randolph street in downtown Chicago is some very expensive real estate. Or should I say “eclectic”?